Department of Chemistry 1, Ramaiah Institute of Technology, Bangalore - 560054, Karnataka, India. Department of Studies and Research in Chemistry 2, Gulbarga University, Kalburgi - 585106, Karnataka, India. ABSTRACT: The desired target Compounds (4a-e), (5a-e) and (6a-e) were prepared in two steps. Reaction of 3-acetyl-6-bromo-2H-chromen-2-one (1) with 3-(Aryl)-1-phenyl-1H-pyrazole-4-carbaldehydes (2a-e) in presence of aqueous KOH solution and the reaction mixture stirred for 2 hours and then filtered, furnished the desired 6-bromo-3-((E)-3-(3-(Aryl)-1-phenyl- 1H-pyrazole-4-yl) acryloyl)- 2H-chromen-2- ones (3a-e) crystalline solids in 60-70% yield (Scheme-1). Further, compounds (3a-e) reaction with thiourea, urea and hydrazine hydrate in the presence of a base in EtOH yielded the compounds (4a-e), (5a-e) and (6a-e) in 50-85% yield. All the synthesized compounds have been characterized by spectral data’s, and they are screened for anti-microbial activity. Among synthesized compounds 3b, 3c, 3d, 5a, and 5d exhibited good activity against bacterial strains S. aureus, P. aeruginosa, and E. coli, respectively. Whereas other compounds showed poor to moderate activity against all bacterial strains and compounds 3a, 3b, 3d, 4c, 5d, and 5c exhibited good antifungal activity against A. niger, and A. flavus and remaining compounds exhibited moderate antifungal activity. Results were tabulated in Table 2. 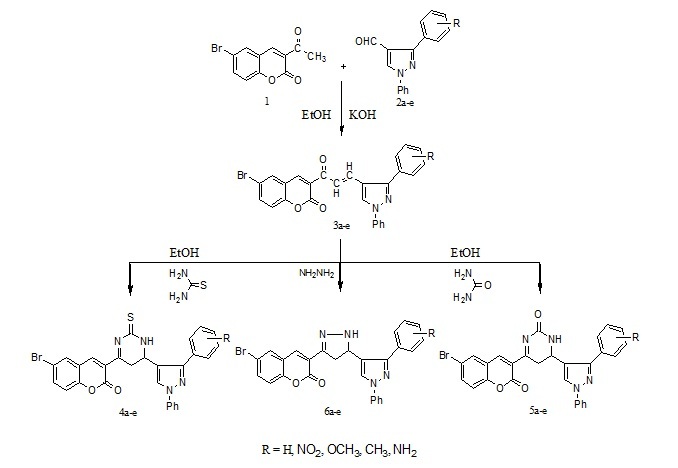 INTRODUCTION:A variety of coumarin derivatives with diverse substituents at C-4 have been found to exhibit anticoagulant, 1 cytochrome 450 inhibiting, 2 antimicrobial and antitumour 3 activities. And also pyrimidines are well known nitrogen-containing six-membered heterocyclic compounds found to possess considerable biological activities, such as, antimycobacterial 4, antimicrobial 5, analgesic, antitumor 6 and antiviral activities. In addition pyrazole derivatives have a broad spectrum of biological activities being used as antipyretic, antidepressant against rheumatoid arthritis, antibacterial 8, 9, anticonvulsant, 10 antifilarial agents, 11 herbicides, 12, 13 fungicides, pesticides, insecticides, anticancer agents 14 and dyestuffs in sunscreen materials. In view of above potent pharmacological activity, we became interested in synthesis and antimicrobial activity of 6- bromo- 3-((E)-3-(3-(Aryl)-1-phenyl-1H-pyrazol-4-yl)acryloyl)- 2H- chromen- 2- ones (3a-e), 6-bromo-3- (1,2,5,6-tetrahydro-6-(3-(Aryl)-1-phenyl-1H-pyrazol-4-yl)- 2- thioxopyrimidin- 4- yl)- 2H-chhromen-2-ones (4a-e), 4- (6-bromo-2-oxo-2H-chromen-3-yl)-5, 6- dihydro-6- (3-(Aryl)-1-phenyl-1H-pyrazol-4-yl) pyrimidin-2(1H)-ones (5a-e) and 6-bromo-3- (4, 5-dihydro-5-(3-(Aryl)-1-phenyl-1H-pyrazol-4-yl)- 1H- pyrazol-3-yl)- 2H- chromen- 2-ones (6a-e). MATERIAL AND METHODS: Melting points were recorded by using Thomas-Hoover melting point apparatus and were uncorrected. IR spectra in KBr disc were recorded on Perkin-Elmer-Spectrum-one FTIR spectrophotometer (νmax in cm-1) and 1H NMR in DMSO-d6 and CDCl3 on amx 400 MHz spectrophotometer using TMS as an internal standard. Mass spectra were recorded on a JEOL SX 102 Mass spectrometer using Argon/Xenon (6kv, 10 mA) as the FAB gas. The purity of the compounds was checked by TLC using silica gel ‘G’ plates obtained from Whatman Inc, and a fluorescent indicator. Elemental analysis was carried out on a Carlo Erba 1108 analyzer. 3-aryl-1-phenyl- 1H- pyrazole- 4- carbaldehydes were prepared by known literature method 20. Preparation of 6-bromo-3-((E)-3-(3-(Aryl)-1-phenyl-1H-pyrazol-4-yl) acryloyl)- 2H-chromen-2-ones (3a-e): 3-Acetyl-6-bromo-2H-chromen-2-one (1) (0.01 mol) and 1,3-diphenyl-1H-pyrazole-4-carbaldehydes (2a-e) (0.01 mol) in absolute alcohol (30 ml) added 5 ml of 10% potassium hydroxide with constant shaking maintaining a temperature of 5-10 ºC. The mixture was stirred for 2 hours at room temperature and kept overnight. The solid separated was collected by filtration and crystallized from ethanol gave the desired 6-bromo-3-((E)-3-(3-(Aryl)- 1- phenyl- 1H- pyrazol-4 - yl) acryloyl)-2H-chromen-2-ones (3a-e). 6-Bromo-3-((E)-3-(1,3-diphenyl- 1H- pyrazol- 4-yl)acryloyl)-2H-chromen-2-one (3a): IR (KBr): 1681, 1H NMR (DMSO-d6, δ in ppm): δ 10.0 (s, 1H, C4H), 8.4 (s, 1H, C5H of pyrazole), 7.8-7.2 (m, 13H ArH, 2H C=CH). Mass (m/z): 496 (M+, 100%). Elemental analysis: Calcd for C27H17BrN2O3: C, 65.20; H, 3.45; N, 5.63. Found: C, 65.18; H, 3.42; N, 5.61. 6-Bromo-3-((E)-3-(3-(4-nitrophenyl)- 1- phenyl-1H-pyrazol-4-yl) acryloyl)- 2H-chromen-2-one (3b): IR (KBr): 1691, 1H NMR (DMSO-d6, δ in ppm): δ 10.1 (s, 1H, C4H), 8.6 (s, 1H, C5H of pyrazole), 8.4-7.2 (m, 12H ArH, 2H C=CH). Mass (m/z): 541 (M+, 10%). Elemental analysis: Calcd for C27H16BrN3O5: C, 59.79; H, 2.97; N, 7.75. Found: C, 59.77; H, 2.95; N, 7.72. 6- Bromo- 3- ((E)-3- (3- (4- methoxyphenyl)- 1-phenyl-1H-pyrazol-4-yl)acryloyl)- 2H- chromen-2-one (3c): IR (KBr): 1681, 1H NMR (DMSO-d6, δ in ppm): δ 10.1 (s, 1H, C4H), 8.6 (s, 1H, C5H of pyrazole), 7.8-7.0 (m, 12H ArH, 2H C=CH), 3.8 (s, 3H, OCH3). Mass (m/z): 526 (M+, 100%). Elemental analysis: Calcd for C28H19BrN2O4: C, 63.77; H, 3.63; N, 5.31. Found: C, 63.75; H, 3.61; N, 5.29. 6- Bromo- 3- ((E)- 3- (1- phenyl- 3-p-tolyl-1H-pyrazol-4-yl)acryloyl)-2H-chromen- 2- one (3d): IR (KBr): 1680, 1H NMR (DMSO-d6, δ in ppm): δ 10.0 (s, 1H, C4H), 8.6 (s, 1H, C5H of pyrazole), 7.8-7.2 (m, 12H ArH, 2H C=CH), 2.4 (s, 3H, CH3). Elemental analysis: Calcd for C28H19BrN2O3: C, 65.76; H, 3.75; N, 5.48. Found: C, 65.74; H, 3.72; N, 5.46. 3- ((E)-3- (3- (4-aminophenyl)- 1- phenyl- 1H-pyrazol-4-yl)acryloyl)-6-bromo-2H- chromen- 2-one (3e): IR (KBr): 1736, 1H NMR (DMSO-d6, δ in ppm): δ 10.0 (s, 1H, C4H), 8.5 (s, 1H, C5H of pyrazole), 7.8-7.2 (m, 12H ArH, 2H C=CH, 2H NH). Mass (m/z): 512 (M+, 5%). Elemental analysis: Calcd for C27H18BrN3O3: C, 63.29; H, 3.54; N, 8.20. Found: C, 63.26; H, 3.50; N, 8.18. Preparation of compounds (4a-e) and (5a-e): 6-Bromo-3-((E)-3-(3-(Aryl)-1-phenyl-1H-pyrazol-4-yl)acryloyl)-2H-chromen-2-ones (3a-e) (0.01 mol) was refluxed with thiourea or urea (0.01 mol) in presence of sodium hydroxide (0.04 mol) in ethanol was refluxed for 15 h, then concentrated and cooled. The separated solid was filtered, washed with water and recrystallised from ethanol yielded the 6-bromo- 3- (1,2,5,6-tetrahydro-6-(3-(Aryl)-1-phenyl-1H-pyrazol-4-yl)- 2- thioxopyrimidin-4-yl)-2H-chhromen-2-ones (4a-e) or 4-(6-bromo-2-oxo-2H-chromen-3-yl)-5, 6- dihydro- 6- (3- (Aryl)-1-phenyl-1H-pyrazol-4-yl)pyrimidin-2(1H)-ones (5a-e) in 50-85% yield. 6- Bromo- 3-(1,2,5,6-tetrahydro-6-(1,3-diphenyl-1H- pyrazol-4-yl)- 2-thioxopyrimidin-4-yl)- 2H-chromen-2-one (4a): IR (KBr): 3225, 1772, 1H NMR (DMSO-d6, δ in ppm): δ 12.2 (s, 1H, NH), 8.8 (s, 1H, C4H), 8.2 (s, 1H, C5H of pyrazole), 7.8-7.0 (m, 13H, ArH). 6.4 (s, 1H, CH), 4.2 (s, 2H, CH2). Mass (m/z): 554 (M+, 10%). Elemental analysis: Calcd for C28H19BrN4O2S: C, 60.55; H, 3.45; N, 10.09. Found: C, 60.55; H, 3.45; N, 10.09. 6- Bromo- 3- (1, 2, 5, 6- tetrahydro-6-(3-(4-nitro-phenyl)- 1- phenyl- 1H- pyrazol-4-yl)- 2-thioxo-pyrimidin-4-yl)- 2H- chromen-2-one (4b): IR (KBr): 3126, 1681, 1H NMR (DMSO-d6, δ in ppm): δ 10 (s, 1H, NH), 9.2 (s, 1H, C4H), 8.5 (s, 1H, C5H of pyrazole), 8.0-7.4 (m, 12H, ArH), 7.2 (s, 1H, CH), 2.5 (s, 2H, CH2). Elemental analysis: Calcd for C28H18BrN5O4S: C, 56.01; H, 3.02; N, 11.66. Found: C, 55.01; H, 3.01; N, 11.62. 6-Bromo-3- (1,2,5,6-tetrahydro-6-(3-(4-methoxy-phenyl)- 1- phenyl- 1H- pyrazol- 4-yl)- 2-thioxo-pyrimidin-4-yl)- 2H- chromen-2- one (4c): IR (KBr): 3124, 1674, 1H NMR (DMSO-d6, δ in ppm): δ 10 (s, 1H, NH), 8.6 (s, 1H, C4H), 7.8 (s, 1H, C5H of pyrazole), 7.6-7.2 (m, 12H, ArH ), 7.0 (s, 1H, CH), 3.8 (s, 3H, OCH3), 2.2 (s, 2H, CH2). Elemental analysis: Calcd for C29H21BrN4O3S: C, 59.49; H, 3.62; N, 9.57. Found: C, 59.46; H, 3.60; N, 9.55. 6-Bromo-3- (1,2,5,6-tetrahydro-6- (1-phenyl-3-p-tolyl- 1H-pyrazol-4-yl)- 2-thioxopyrimidin-4-yl)-2H-chromen-2-one (4d): IR (KBr): 3321, 1699, 1H NMR (DMSO-d6, δ in ppm): δ 10 (s, 1H, NH), 9.4 (s, 1H, C4H), 8.0 (s, 1H, C5H of pyrazole), 7.6-7.4 (m, 12H, ArH, 1H, CH ), 3.4 (s, 3H, OCH3), 2.5 (s, 3H, CH3), 2.2 (s, 2H, CH2). Mass (m/z): 568 (M+, 10%). Elemental analysis: Calcd for C29H21BrN4O2S: C, 61.16; H, 3.72; N, 9.84. Found: C, 61.14; H, 3.70; N, 9.81. 3-(6-(3-(4-Aminophenyl)- 1-phenyl- 1H-pyrazol-4-yl)-1,2,5,6-tetrahydro-2-thioxopyrimidin-4-yl)-6-bromo-2H-chromen-2-one (4e): IR (KBr): 3298, 1699, 1H NMR (DMSO-d6, δ in ppm): δ 10.4 (s, 1H, NH), 9.8 (s, 1H, C4H), 9.4 (s, 1H, C5H of pyrazole), 7.8-7.4 (m, 12H, ArH ), 7.0 (s, 1H, CH), 4.0 (d, 2H, NH), 2.5 (s, 2H, CH2). Elemental analysis: Calcd for C28H20BrN5O2S: C, 58.95; H, 3.53; N, 12.28. Found: C, 58.92; H, 3.50; N, 12.25. 4- (6-Bromo- 2-oxo- 2H-chromen- 3- yl)- 5, 6-dihydro-6-(1,3-diphenyl-1H-pyrazol-4-yl) pyrimi din-2(1H)-one (5a): IR (KBr): 3107, 1624, 1H NMR (DMSO-d6, δ in ppm): δ 10.0 (s, 1H, NH), 9.4 (s, 1H, C4H), 8.0 (s, 1H, C5H of pyrazole), 7.8-7.2 (m, 13H, ArH ), 7.0 (s, 1H, CH), 2.5 (s, 2H, CH2). Mass (m/z): 538 (M+, 10%). Elemental analysis: Calcd for C28H19BrN4O3: C, 62.35; H, 3.55; N, 10.39. Found: C, 62.35; H, 3.55; N, 10.39. 4- (6- Bromo-2-oxo-2H-chromen-3- yl)-5, 6- di-hydro- 6- (3- (4- nitrophenyl)-1-phenyl-1H-pyra-zol-4-yl) pyrimidin-2(1H)-one (5b): IR (KBr): 3045, 1624, 1H NMR (DMSO-d6, δ in ppm): δ 10.4 (s, 1H, NH), 9.6 (s, 1H, C4H), 9.2 (s, 1H, C5H of pyrazole), 8.0-7.2 (m, 12H, ArH ), 7.0 (s, 1H, CH), 2.5 (s, 2H, CH2). Elemental analysis: Calcd for C28H19BrN4O3: C, 57.55; H, 3.10; N, 11.98. Found: C, 57.52; H, 3.08; N, 11.95. 4- (6- Bromo- 2-oxo- 2H- chromen- 3- yl)- 5, 6-dihydro- 6-(3-(4-methoxyphenyl)- 1- phenyl- 1H-pyrazol-4-yl)pyrimidin-2(1H)-one (5c): IR (KBr): 2920, 1624, 1H NMR (DMSO-d6, δ in ppm): δ 10.0 (s, 1H, NH), 9.4 (s, 1H, C4H), 8.0 (s, 1H, C5H of pyrazole), 7.8-7.5 (m, 12H, ArH, 1H, CH ), 3.4 (s, 3H, OCH3), 2.5 (s, 2H, CH2). Elemental analysis: Calcd for C29H21BrN4O4: C, 61.17; H, 3.72; N, 9.84. Found: C, 61.15; H, 3.70; N, 9.80. 4- (6- Bromo- 2- oxo- 2H- chromen- 3- yl)- 5, 6-dihydro- 6- (1-phenyl-3-p-tolyl-1H-pyrazol-4-yl) pyrimidin-2(1H)-one (5d): 1H NMR (DMSO-d6, δ in ppm): δ 11.8 (s, 1H, NH), 9.2 (s, 1H, C4H), 8.8 (s, 1H, C5H of pyrazole), 8.2-7.4 (m, 12H, ArH, 1H, CH ), 3.5 (s, 3H, CH3), 2.5 (s, 2H, CH2). Mass (m/z): 552 (M+, 10%). Elemental analysis: Calcd for C29H21BrN4O4: C, 62.94; H, 3.82; N, 10.12. Found: C, 62.91; H, 3.80; N, 10.10. 6- (3-(4-Aminophenyl)- 1- phenyl-1H-pyrazol-4-yl)- 4- (6-bromo-2-oxo-2H-chromen-3-yl)- 5, 6-dihydropyrimidin- 2(1H)-one (5e): 1H NMR (DMSO-d6, δ in ppm): δ 10.4 (s, 1H, NH), 9.8 (s, 1H, C4H), 9.2 (s, 1H, C5H of pyrazole), 8.5-6.5 (m, 12H, ArH, 1H, CH , 2H, NH), 2.5 (s, 2H, CH2). Elemental analysis: Calcd for C28H20BrN5O3: C, 60.66; H, 3.64; N, 12.63. Found: C, 60.63; H, 3.62; N, 12.60. Preparation of 6-bromo-3-(4, 5-dihydro-5-(3-(Aryl)-1-phenyl-1H-pyrazol-4-yl)-1H-pyrazol-3-yl)-2H-chromen-2-ones (6a-e): Reaction of compounds (3a-e) (0.01 mol) with hydrazine hydrate (0.01 mol) in ethanol (30 ml). The reaction mixture was refluxed for 5 h and then concentrated and cooled. The solid separated was filtered, washed several times with water and recrytallised from ethanol yielded the desired compounds (6a-e). 6-Bromo-3-(4, 5-dihydro-5-(1, 3-diphenyl-1H-pyrazol-4-yl)- 1H-pyrazol-3-yl)- 2H-chromen- 2-one (6a): IR (KBr): 3121, 1661, 1H NMR (DMSO-d6, δ in ppm): δ 9.4 (s, 1H, NH), 9.2 (s, 1H, C4H), 8.8 (s, 1H, C5H of pyrazole), 8.0-7.2 (m, 12H, ArH, 1H, CH ), 2.5 (s, 2H, CH2). Mass (m/z): 510 (M+, 10%). Elemental analysis: Calcd for C27H19BrN4O2: C, 63.42; H, 3.75; N, 10.96. Found: C, 63.40; H, 3.72; N, 10.91. 6-Bromo-3-(4, 5-dihydro-5- (3- (4-nitrophenyl)- 1-phenyl-1H-pyrazol-4-yl)-1H-pyrazol-3-yl)-2H-chromen-2-one (6b): IR (KBr): 3128, 1691, 1H NMR (DMSO-d6, δ in ppm): δ 10.2 (s, 1H, NH), 8.4 (s, 1H, C4H), 8.0 (s, 1H, C5H of pyrazole), 7.5-7.0 (m, 12H, ArH, 1H, CH ), 2.5 (s, 2H, CH2). Elemental analysis: Calcd for C27H18BrN5O4: C, 58.29; H, 3.26; N, 12.59. Found: C, 58.27; H, 3.22; N, 12.56. 6- Bromo- 3- (4, 5-dihydro-5- (3- (4- methoxy-phenyl)-1-phenyl-1H-pyrazol-4-yl)-1H-pyrazol-3-yl)-2H-chromen-2-one (6c): IR (KBr): 3203, 1637, 1H NMR (DMSO-d6, δ in ppm): δ 9.0 (s, 1H, NH), 8.4 (s, 1H, C4H), 8.0 (s, 1H, C5H of pyrazole), 7.5-7.0 (m, 12H, ArH, 1H, CH ), 3.5 (s, 3H, OCH3), 2.5 (s, 2H, CH2). Mass (m/z): 540 (M+, 10%). Elemental analysis: Calcd for C28H21BrN4O3: C, 62.12; H, 3.91; N, 10.35. Found: C, 62.10; H, 3.88; N, 10.30. 6- Bromo-3- (4, 5-dihydro-5-(1-phenyl-3-p-tolyl-1H-pyrazol-4-yl)-1H-pyrazol-3-yl)-2H-chromen-2-one (6d): IR (KBr): 3367, 1861, 1H NMR (DMSO-d6, δ in ppm): δ 11.0 (s, 1H, NH), 9.0 (s, 1H, C4H), 8.8 (s, 1H, C5H of pyrazole), 8.4-7.0 (m, 12H, ArH, 1H, CH ), 3.4 (s, 3H, CH3), 2.5 (s, 2H, CH2). Mass (m/z): 524 (M+, 10%). Elemental analysis: Calcd for C28H21BrN4O2: C, 64.01; H, 4.03; N, 10.66. Found: C, 63.01; H, 4.01; N, 10.63. 3- (5- (3-(4-Aminophenyl)-1-phenyl-1H-pyrazol-4-yl)-4,5-dihydro-1H-pyrazol-3-yl)-6-bromo-2H-chromen-2-one (6e): IR (KBr): 3207, 1H NMR (DMSO-d6, δ in ppm): δ 10.5 (s, 1H, NH), 9.2 (s, 1H, C4H), 8.6 (s, 1H, C5H of pyrazole), 8.4-7.0 (m, 12H, ArH, 1H, CH ), 3.2 (s, 3H, CH3), 2.5 (s, 2H, CH2). Mass (m/z): 525 (M+, 10%). Elemental analysis: Calcd for C27H20BrN5O2: C, 61.61; H, 3.83; N, 13.30. Found: C, 61.59; H, 3.80; N, 13.28. RESULT AND DISCUSSION: The desired target compounds (4a-e), (5a-e) and (6a-e) were prepared in two steps. Reaction of 3-acetyl-6-bromo-2H-chromen-2-one (1) with 3-(Aryl)-1-phenyl-1H-pyrazole-4-carbaldehydes (2a-e) in presence of aqueous KOH solution and the reaction mixture was stirred for 2 hours and then filtered, furnished the desired 6-bromo-3-((E)-3-(3-(Aryl)-1-phenyl-1H-pyrazole-4-yl) acryloyl)- 2H- chromen- 2- ones (3a-e) crystalline solids in 60-80% yield (Scheme-1). Its IR spectrum confirmed the formation of compound 3a shows absorption at 1681 cm-1 due to C=O. Further compound 3a was confirmed by 1H NMR spectrum shows signals at δ 10.0 (s, 1H, C4H), 8.4 (s, 1H, C5H of pyrazole), 7.8-7.2 (m, 13H, ArH, 2H, C=CH). The molecular ion peak of compound 3a was observed at (m/z): 496 (M+, 100%) in its mass spectrum. Further, compounds (3a-e) reaction with thiourea, urea and hydrazine hydrate in the presence of a base in EtOH yielded the compounds (4a-e), (5a-e) and (6a-e) in 50-85% yield. Its IR spectrum confirmed the formation of compound 4a shows absorption at 3225, 1772 cm-1 due to NH and C=O. Further, compound 4a was confirmed by 1H NMR spectrum shows signals at 1H NMR (DMSO-d6, δ in ppm): δ 12.2 (s, 1H, NH), 8.8 (s, 1H, C4H), 8.2 (s, 1H, C5H of pyrazole), 7.8-7.0 (m, 13H, ArH). 6.4 (s, 1H, CH), 4.2 (s, 2H, CH2). The molecular ion peak of compound 4a was observed at m/z = 554 (M+, 10%) in its mass spectrum. Formation of compound 5a was confirmed by its IR spectrum shows absorption at 3107 and 1624 cm-1 due to the presence of NH, C=O stretching. Further, compound 5a was confirmed by 1H NMR spectrum shows signals at δ 10.0 (s, 1H, NH), 9.4 (s, 1H, C4H), 8.0 (s, 1H, C5H of pyrazole), 7.8-7.2 (m, 13H, ArH), 7.0 (s, 1H, CH), 2.5 (s, 2H, CH2). The molecular ion peak of compound 5a was observed at m/z = 538 (M+, 10%) in its mass spectrum. Its IR spectrum confirmed the formation of compound 6a shows absorption at 3121 and 1661 cm-1 due to the presence of NH and C=O stretching. Further, compound 6a was confirmed by 1H NMR spectrum shows signals at δ 9.4 (s, 1H, NH), 9.2 (s, 1H, C4H), 8.8 (s, 1H, C5H of pyrazole), 8.0-7.2 (m, 12H, ArH, 1H, CH), 2.5 (s, 2H, CH2). The molecular ion peak of compound 6a was observed at m/z = 510 (M+, 10%) in its mass spectrum. Physical constants and yield of all the synthesized compounds are tabulated in Table 1. Antimicrobial Activity: The antimicrobial activities were performed by the cup plate method. The synthesized compounds, gentamycin and fluconazole was dissolved in DMF at the concentration of 1000 µg/ml. Antibacterial activity screened against, S. aureus, E-coli and, P. aeruginosa. Antifungal activity was carried out against A. niger and A. flavus under aseptic conditions. Gentamycin and fluconazole were used as a standard drug for antibacterial and antifungal activities. The zone of inhibition was compared with standard drug after 24 h of incubation at 25 ºC for antibacterial activity and 48 hours at 30 ºC for antifungal activity. Among synthesized compounds 3b, 3c, 3d, 5a, and 5d exhibited good activity against bacterial strains S. aureus, P. aeruginosa and E. coli, respectively. Whereas other compounds showed poor to moderate activity against all bacterial strains and 3a, 3b, 3d, 4c 5d, and 5c exhibited good antifungal activity against A. niger and A. flavus and remaining compounds exhibited moderate antifungal activity. Results were tabulated in Table 2. CONCLUSION: Among synthesized compounds 3b, 3c, 3d, 5a, and 5d exhibited good activity against bacterial strains S. aureus, P. aeruginosa and E. coli, respectively. Whereas other compounds showed poor to moderate activity against all bacterial strains and compounds 3a, 3b, 3d, 4c, 5d, and 5c exhibited good antifungal activity against A. niger, and A. flavus and remaining compounds exhibited moderate antifungal activity. ACKNOWLEDGEMENT: The authors are highly thankful to the Department of Chemistry, Gulbarga University Kalburgi, Karnataka for the needful support. CONFLICT OF INTEREST: The authors declared no competing interests. Koshihara NT and Murota Y: Inhibitory effect of esculetin on 5-lipoxygenase and leukotriene. Biochem Biophys Acta 1983; 753: 130-132. Fylaktakidou KC, Hadjipavlou-Litina D, Litinas KE and Nicolaides DN: Natural and synthetic coumarin derivatives with anti-inflammatory/antioxidant activities. Curr Pharm Design 2004; 10: 3813-33. Rao S, Aoyama R, Schrag M, Trager WF, Rettie A and Jones JP: A Refined 3-Dimensional QSAR of Cytochrome P450 2C9: Computational Predictions of Drug Interactions. J Med Chem 2000; 43: 2789-2796. Kumar A, Sinha S and Chauhan MS: Synthesis and anti-angiogenic activity of 6-(1,2,4-Thiadiazol-5-yl)-3-amino. Bioorg Med Chem Lett 2002; 12: 667-669. Kumar N, Singh G and Yadav AK: Synthesis of some new pyrido[2,3‐d]pyrimidines and their ribofuranosides as possible antimicrobial agents. Heteroatom Chem 2001; 12: 52-56. Sondhi SM, Johar M, Rajvanshi S, Dastidar SG, Shukla R, Raghubir R and Lown JW: Anticancer, anti-inflammatory and analgesic activity evaluation of heterocyclic compounds synthesized by the reaction of 4-Isothicyanato-4- methylpentan-2-one with substituted o-Phenylenediamine, oDiaminopyridine and (un)substituted o-Diaminopyrimidines. Aust J Chem 2001; 54: 69-74. Nasr MN and Gineinah MM: Pyrido[2, 3-d]pyrimidines and pyrimido[5',4':5, 6]pyrido[2, 3-d]pyrimidines as new antiviral agents: synthesis and biological activity. Arch Pharm 2002; 335: 289-235. Genin MJ, Biles C, Keiser BJ, Poppe SM, Swaney SM, Tarpley WG, Yagi Y and Romero DL: Novel 1,5-diphenylpyrazole nonnucleoside HIV-1 reverse transcriptase inhibitors with enhanced activity versus the delavirdine-resistant P236L mutant: lead identification and SAR of 3- and 4-substituted derivatives. J Med Chem 2000; 43: 1034-40. Chauhan PMS, Singh S and Chatterjee RK: synthesis and in-vitro antimicrobial studies of some new pyrazolones. Indian J Chem 1993; 32: 858. Natsume B, Kyomura N, Kikutake K and Fukuch T: An efficient catalyst for the synthesis of 1,3,5-trisubstituted Pyrazoles. Eur Pat Appl EP 1992; 116: 128. Londershausen M: Review: approaches to new parasiticides. Pestic Sci 1996; 48: 269-407. Garcia H, Iborra S, Miranda MA and Morera IM: Primo: Zinc mediated reduction of bromohydrins in azetidinones and penems. Application to the synthesis of FCE 22891. J. heterocycles 1991; 32: 1671-1679. Uzoukwu AB: 4-[(Z)-(2-Furyl)(2-naphthylamino) methylene)]-3-methyl-1-phenyl-1 H -pyrazol-5(4 H )- one. Polyhedron 1993; 12: 2719-2724. Daidone G, Maggio B, Plescia S, Raffa D, Musiu C, Milia C, Perra G and Marongiu ME: Synthesis of 3-amino 1H-pyrazoles catalyzed by p-toluene sulphonic acid using polyethylene glycol-400 as an efficient and recyclable reaction medium. Eur J Med Chem 1998; 33: 375. Reddy Gj, Latha D and Rao KS: Synthesis of some new Ethyl-4-(1, 3- Diarylpyrazol-4-yl)-6-Methyl-2- thioxo-1, 3, 4-trihydropyrimidine- 5- carboxylates Heterocyclic Communications 2004; 10: 331. Patil SB and Goudgaon NM: Synthesis and antimicrobial activity of some novel coumarin analogues. Int J Pharm Sci & Res 2019; 10(2): 960-65. doi: 10.13040/IJPSR.0975-8232.10(2).960-65.